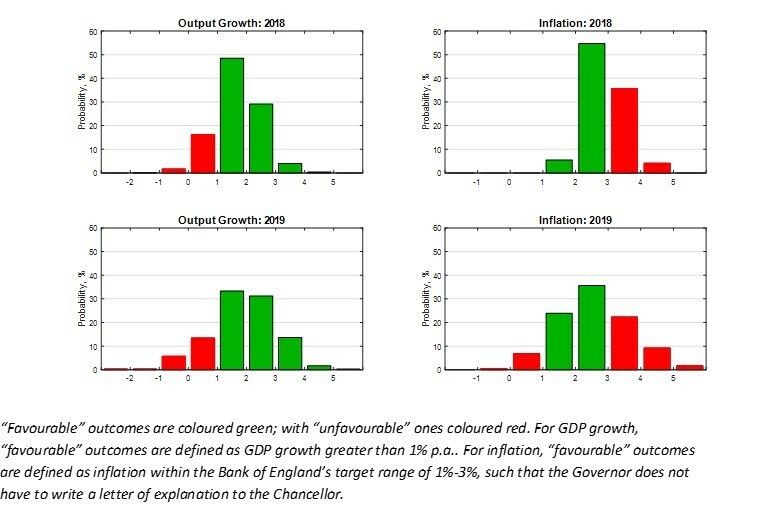 The figure below presents WBS's latest (as of 22nd February 2018) probabilistic forecasts for real GDP growth and inflation - for 2018 and 2019 - as histograms. Conditioning on the latest GDP data from the ONS for 2017Q4, both the figure and Table 1 below reveal that the most likely outcome is that economic growth is between 1% and 2% in 2018. But, indicating some upside potential, the probability of growth greater than 2% is higher than the probability of growth being less than 1%. Economic growth prospects for 2019 are more uncertain; growth between 1% and 2% is still the most likely outcome, but there is a higher probability of stronger growth. There is a 47% chance of growth greater than 2% in 2019 relative to only a 33% chance of growth greater than 2% in 2018. Relative to our forecasts made one quarter ago, inflation risks have risen for 2018. There is now a 40% chance that inflation exceeds 3% in 2018 relative to a 27% chance forecast one quarter ago. There also remains a 33% chance that inflation persists and exceeds 3% in 2019. But inflationary prospects are forecast to be more evenly balanced for 2019, with a near equal chance of inflation falling between 1% and 2%, and 3% and 4%. Accordingly, we take the most recent point forecasts from the Bank of England, the IMF and the OECD. Table 2 shows that while the Bank of England is more optimistic than the WBSFS about GDP growth in 2018, the IMF and OECD are more pessimistic. But looking further ahead to 2019 we see that all three forecasters, especially the OECD, are more pessimistic about GDP growth prospects than the WBSFS. The WBSFS also suggests that the Bank of England, IMF and OECD think inflation will come down more quickly. In both 2018 and 2019 the WBSFS suggests that there is a greater than 50% chance that inflation exceeds their forecasts.